The Insignia Grand Sport is too compelling to ignore. The comfort, space, equipment and quality it provides make Vauxhall’s number one slot in the sector look assured. 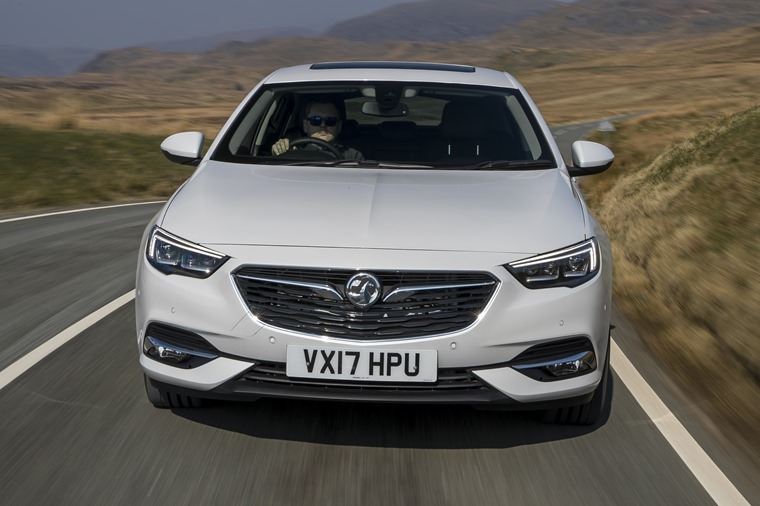 There is a raft of numbers we could bandy about where the new Vauxhall Insignia Grand Sport is concerned, but there’s only one that really matters. 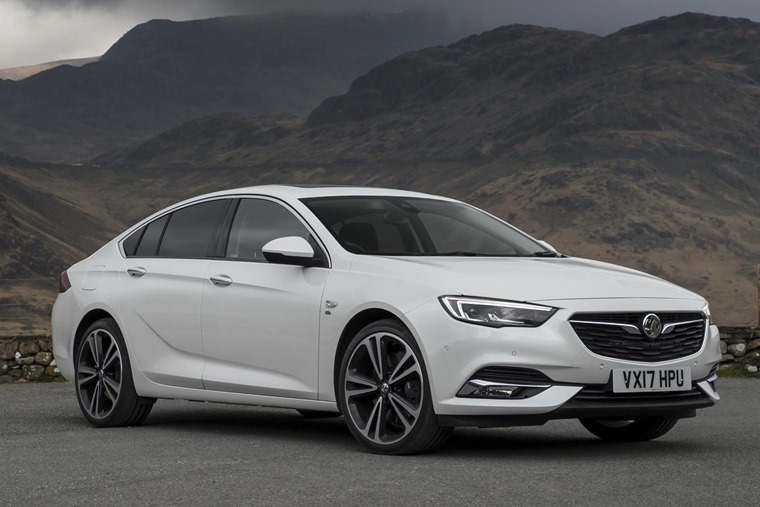 This is the previous Insignia was the number one seller in its sector and the new model is charged with not only maintaining that position but consolidating it. With many thousands of those Insignia drivers coming from the lease sector, it’s a hugely important car for this market. This is why Vauxhall has poured its heart and soul into this second generation model. It all starts with a completely new platform that helps the new car to be as much as 175kg lighter than the one it replaces. This is despite the Grand Sport being longer and wider, as well as being significantly stiffer to help with handling and crash protection. On this base, a more refined body style has been created that has a drag coefficient of 0.26Cd, which is among the best in class. That helps with improving fuel economy and emissions, which are significant considerations in this field for the dominant majority of business users that will make up Grand Sport sales. It all starts with a completely new platform that helps the new car to be as much as 175kg lighter than the one it replaces. A quick run-through of the numbers shows the most efficient engine is the 110hp 1.6-litre turbodiesel that returns 70.6mpg and 105g/km carbon dioxide emissions. It’s a solid performer that offers 0-62mph in 10.9 seconds, but far more will choose the 136bhp version with its 9.9 seconds 0-62mph sprint coupled to 65.7mpg and 114g/km. This is with the six-speed manual gearbox that’s standard, but you could opt for a smooth-shifting eight-speed auto as an alternative if you don’t mind slightly worse economy and emission stats. After driving this turbodiesel engine, it’s abundantly clear that the great slice of Grand Sport drivers who will choose this unit are going to be very satisfied. It really is the sweet spot of the diesel line-up and its refinement puts it right at the head of its field. Even compared to the premium saloon and hatches from the likes of Audi, BMW and Mercedes, the Vauxhall is as good, if not better than most. High praise, but the Insignia deserves it as refinement is a much underrated quality. A hushed car will deliver you feeling relaxed and ready to go into that meeting or enjoy your evening at home rather than feeling haggard. It also makes conversation in the Vauxhall very easy at all speeds. When it comes to performance, the 1.6-litre diesel picks up cleanly and quickly from barely over tick-over and pulls strongly through to the rev counter’s red line. Okay, it’s no ball of fire, but it’s ideal for the work most will want it for and it feels livelier than a Ford Mondeo with a similarly sized diesel engine. Another area where the Insignia has a noticeable advantage over its Blue Oval rival is the way the Grand Sport masks its size. It may have one of the largest footprints in the sector, but the Vauxhall feels easy to place and light on its feet where the Mondeo can on occasion appear cumbersome and, well, a bit portly. You can tailor the Insignia’s drive to your tastes. Granted, a BMW 3 Series outdoes both for agility, but the Insignia handles with calm composure. A torque vectoring system helps here and it’s fitted to every model, so you get a helping hand if you find the bend tightens up unexpectedly. 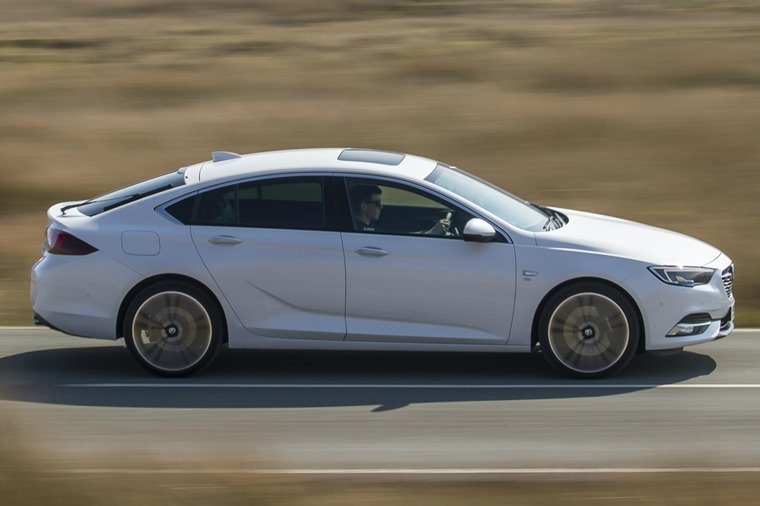 Couple this to the optional FlexRide system that offers Normal, Sport and Tourer settings and you can tailor the Insignia’s drive to your tastes. We also tried the larger 2.0-litre turbodiesel that has 170hp. It delivers 0-62mph in 8.2 seconds and gives 54.3mpg, but unless you need the extra oomph for towing, we see little point in spending the extra as the engine is not as hushed and doesn’t feel any more flexible in ebb and flow conditions. As for the petrols, you can have a 260hp 2.0-litre turbo that comes with all-wheel drive and an eight-speed auto as standard. With acceleration from rest to 62mph in 6.9 seconds, it’s brisk but 32.8mpg and 197g/km hamstring its appeal. More relevant is the pair of 1.5-litre turbo petrols that come in 140- and 165hp forms. There’s only 0.5mpg and 3g/km difference between the two, so you might as well have the more potent unit that gives 47.1mpg and 136g/km. Choose this and you’ll also see the benchmark dash taken care of in 8.4 seconds. More importantly, it’s also impressively quiet, happy to rev hard and has a broad spread of torque to make driving in all situations very straightforward. If diesel isn’t a core requirement for you, this is a very good bet. In all of the Insignias we tried, the ride was another stand-out feature. It rides the bumps with a considered control that shows Vauxhall knows how to tune cars for the UK’s abysmal tarmac as well as anyone. 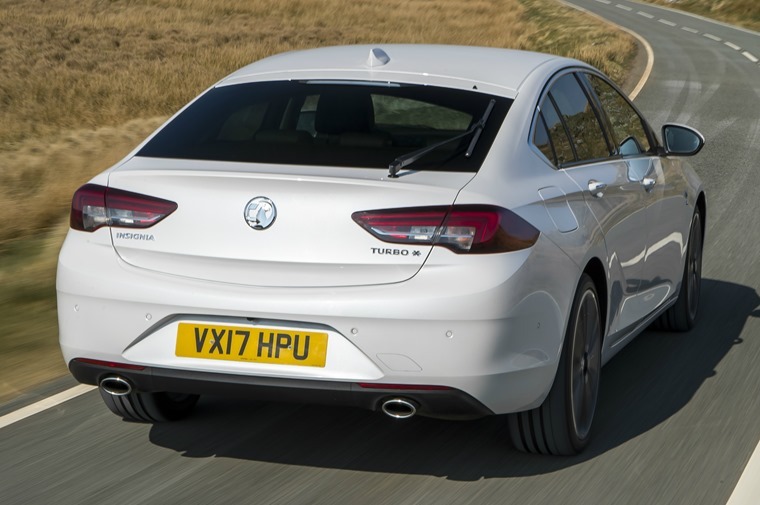 That also means the Grand Sport handles nimbly and steers accurately, though the steering doesn’t have quite the precision of a Mondeo’s or 3 Series’. No matter, as inside the Grand Sport it’s all very well made and there’s bags of room for those in the front and back seats. The driver has height adjustment in the chair and all-round vision is good, even with the swoopy roof line. 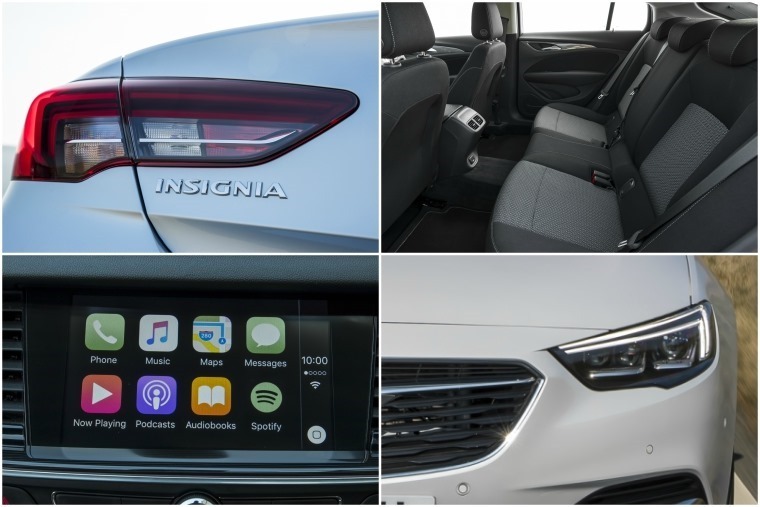 The new dash design incorporates the centre console into the whole compared to the more bitsa approach of the previous Insignia. There are also far fewer buttons on the dash thanks to the new Intellink infotainment screen that’s standard on all models. It’s easy to navigate and there’s a larger eight-inch screen on higher trim models. You also get OnStar connectivity with every Grand Sport to help with navigation and safety. Step round to the boot and you’ll find the Grand Sport’s luggage compartment has shrunk ever so slightly compared to its predecessor, but it’s still generous at 490-litres with the seats up. Drop the 40-20-40 split rear bench and you can free up 1450-litres. All of this costs from £17,115 for the entry-point Design model with the 140hp 1.5 Turbo engine, but you should reckon on a list price of £21,580 for the Grand Sport in fleet-friendly Tech Line spec with the 136hp 1.6-litre Turbo D motor and manual transmission. With whole life costs that undercut almost every rival, this makes the Insignia Grand Sport too compelling to ignore on numbers alone. But what makes this one of the most attractive choices in its sector is the comfort, space, equipment and quality it provides. As a result, Vauxhall’s number one slot looks assured.